Our first encounter with the artworks of Migs Villanueva was during the 2011 edition of Art Expo Malaysia, where we subsequently acquired one of her pieces on exhibit, The Loop, which you may have seen at the gallery during your visit. It is therefore a great privilege for Artemis Art to have the opportunity to feature five of her works at the gallery, a subset of the artist’s eighth solo exhibition, Right of Way, held at this year’s Art Expo Malaysia PLUS, in October 2017. The solo was part of Galerie Francesca‘s participation in the art fair, and the mini feature is made possible through a collaboration with the Manila-based gallery. To say that Migs Villanueva is a multi-talented individual would be an understatement. In addition to being a visual artist, Migs is also an accomplished writer, her short stories having won the Carlos Palanca Memorial Awards in 2002, 2004 and 2006. And before that, she was a corporate career person, including heading the Gold Packaging and Manufacturing Corporation in the 1990s. After leaving the corporate world, Migs embarked on her journey to develop her creative side, both as a visual artist as well as a writer, a journey that has proven to be very fruitful, finding success in both fields. Today, Migs Villanueva has established herself as a visual artist who is much sought after in the Philippines. 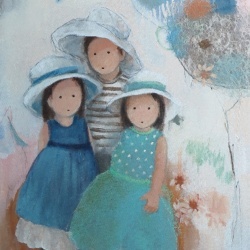 Her artworks are dreamy depictions of children, celebrations of childhood innocence. From her success in the literary realm, Migs certainly has a good grasp of the narrative. But her works are not direct narratives, nor are they meant to convey specific stories. The five artwork mini-feature is part of Artemis Art’s general hanging for Gallery Weekend Kuala Lumpur (GWKL), which takes place from December 8 to 10, 2017. Artemis Art’s focused feature sees five of Migs Villanueva’s works exhibited for a limited time. These works are a subset of the complete Right of Way collection shown by Galerie Francesca during the 2017 edition of Art Expo Malaysia in October this year. Other works from the collection may be viewed from Galerie Francesca’s feature page for the exhibition. Galerie Francesca is pleased to present Right of Way, Migs Villanueva’s eighth solo exhibition. Villanueva is both a multi-awarded writer and a very much sought after painter in the Philippines. 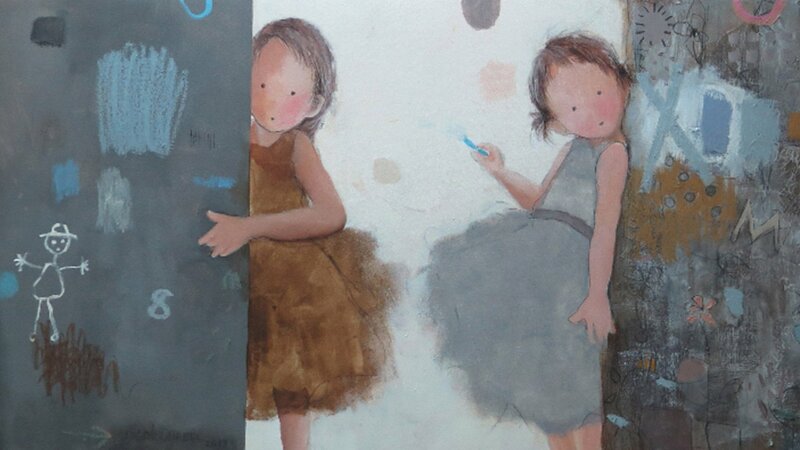 She is known for her refreshingly simplified depiction of children, which pares down the elements of form to their most basic, to highlight essence instead. 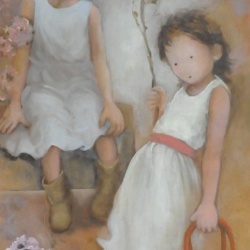 Using the simplest lines and often, only hints of harmonious color, she is able to convey simplicity and innocence – precious attributes in children, which, we as adults tend to lose. In Right of Way, the artist expresses her insight that she has gained now that she is a grandmother. Remembering how as a mother, she thought that it was but right to correct her children when they are becoming fanciful and playful when social situations dictate that they behave to rear them as better adults, Villanueva now sees that as a grandmother, here priorities have changed. Instead of insisting on a particular behavior, she gives her grandchildren the right to do as they please, to prolong their childhood as much as possible. 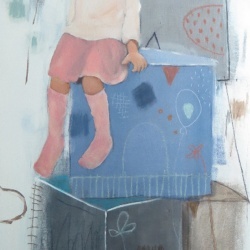 Delighting in their playful innocence, she paints them in various activities suggesting situations of joyful discovery and make-believe wonder. 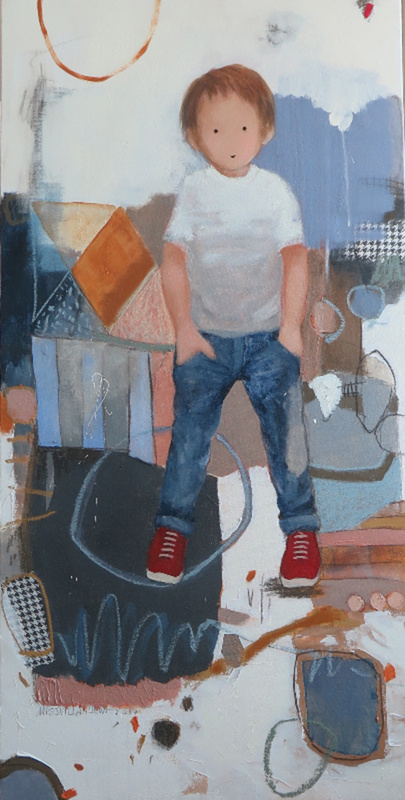 In this new exhibition, additional elements of abstraction and collage create a background which complements the children and create a playful context which heightens the narrative of each work. Using materials sourced from her own past, she imbues each work with deep personal connection, meaning and nostalgia. 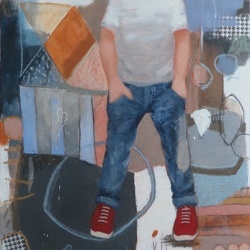 By sharing her own experiences through her work, she invites viewers to make their own connection with their own childhood, and remember their own joys, when they were themselves children. 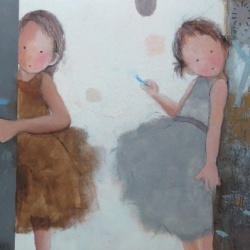 There is a saying which goes “the deeper the mud, the more beautiful the lotus blooms.” This somehow stuck to my mind when Migs Villanueva described the moment she started painting children (seven?) years ago. She told me that the first time she painted them, was when she saw street children being chased by the police, running for some misdemeanor perhaps. “What struck me was their eyes. They were eyes of adults, even though they were just kids. I remembered my own children. So I painted those kids again, but I brought them back to their innocence,” said Villanueva. It is with this same motivation that Villanueva creates this exhibition: “Right of Way”. The term “right of way” implies one party getting their way, and the other making way for them to do so. As a grandmother of (three? ), Villanueva shares “when you are with your grandchildren, you are more relaxed. I was stricter with my own kids. I realize that the best gift I could give my grandchildren is to let them enjoy their childhood as long as they can.” Enabling her grandchildren to grow to the persons they are born to be, by giving them their right of way to explore things and be kids, is a powerful gesture of empathy and compassion. In a world where innocence is easily lost, creating a safe and accepting space is an imperative human act. It is in this same assertion that the Villanueva’s paintings derive their power. It is through gracious acts like these that we will save our world.